Aamir & Iman's wedding beautifully combined the glitz and glamour of chandeliers and candles with the warmth and romance that comes with organic and natural florals. The outdoor ceremony was staged on the garden lawn at the beautiful Four Seasons Westlake Village. Guests were treated to a visual feast of carefully antiqued gold props and organic florals with vibrant pops of color. Golden doors were adorned with cascading garland while large floral pieces sat atop classic urns. Placed at the entrance to the aisle, guests immediately knew they were in for a treat! Aamir & Iman were married in front of a custom built gold frame draped with a deep red chiffon (that matched Iman's lengha perfectly!). We wrapped a large garland asymmetrically around the frame with a large floral cuff on the side. The ceremony was simple yet elegant, but the reception really took our breath away! The ballroom at the Four Seasons has one of the most elegant arrangements of chandeliers ever, so of course we had to bring it with our own! Long tables featured a very organic wave design with glimmering chandeliers handing. 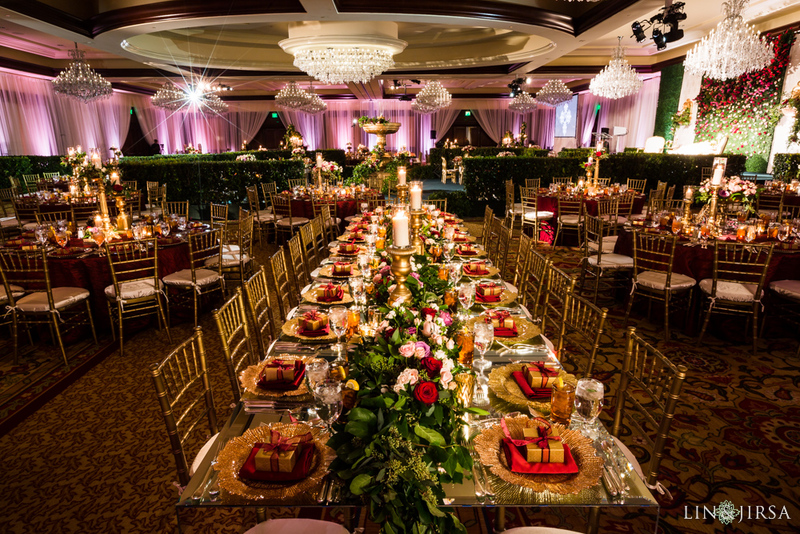 Beautiful red linens complemented the red and pinks in the floral arrangements while gold chargers matched the votives, chiavari chairs, and candlesticks. Florals for the round tables sat on mirrored platforms while long tables had mirrored tabletops- which reflected the light from the candles and chandeliers so beautifully! Our other long tables featured a low design with a table runner of garland with gold pillar candlesticks and votives intermingled. Gold starburst chargers integrated more gold into the design. We brought in real hedges to place in front of the stage, which showcased luxurious white and gold furniture. Directly behind the couple was a tall backdrop with vibrant red and pink florals creating an ombre effect. As always, it is such a pleasure to work with Ajita and her team at Ajita Chopra Events!